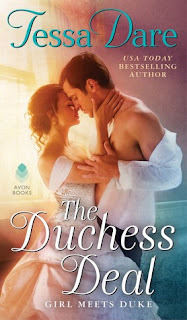 The Duchess Deal is book one of the Girl Meets Duke series. I'm addicted to books by Tessa Dare so of course, I had to grab this one. With this being the start to a new series it still brings all the great aspects that you'd expect from a Tessa Dare book. It's full of heart melting romance, with hard headed leading characters you can't get enough of. We start out meeting Emma Gladstone, a seamstress in a rather unconventional way. You see, Annabelle Worthing requested a wedding dress, which Emma made but then the wedding was called off and no one ever paid her for her work. Emma decides to go to the Duke of Ashbury and request the money due from his ex-fiancee, she does so by wearing the dress to confront him. Ash grants her the money but is in need of a wife that can bear an heir and sets his sights on Emma after that confrontation. He's so used to everyone being revolted by the scars he got from the war and has a major chip in his shoulder from it too. After a little back and forth, they decide to have a marriage of convenience but each sets some rules in place. He pretty much just wants her to get pregnant and then she's off to another estate, but she wants dinner together each evening as well as actual conversations to get to know one another. As you can imagine Emma ruffles his feathers and with each page you can see them grow closer, even though the Duke doesn't realize until he's hooked. The Duchess Deal is an addicting read you won't want to put down. The characters are attention grabbing and have their own flaws which really brings a touch of realness to the story. I've found the leading ladies in TDare books tend to not be pushovers which I really appreciate since it leads to an entertaining read. I'd recommend this book to anyone fond of historical romance with a marriage of convenience trope. Such a lovely book, I hope you enjoy! I was laughing so hard at that! YAAAAAAY! I absolutely adored this book. The opening scene was so hilarious, I was practically cackling while reading it. Gah! I ship these two more than I ship more HR couples (and I ship everybody hehehehe). I can't wait to read more from this series! This author has written so many amazing books and this was no exception. I did enjoy this one quite a bit, the first book I have really enjoyed from Dare since her Spindle Cove series. There was a lot to enjoy about this one. Even the circle of friends was a great aspect and especially how they just include the hero into their circle of friends, especially in how much he needs friendship just made my heart melt. Love her Spindle Cove books!!! I saw some of her posts on Facebook I think yesterday and was laughing!! I haven't read any of her books yet. This sounds quite good. So good, hope you try them!! Can't wait to see your thoughts! Oh, I saw this one on Goodreads while I was picking books for WoW, and it really intrigued me. Glad you enjoyed it, and I hope I get the chance to read it too! Oh you enjoy it as much as I did Francesca! !